Lobelia Loosestrife is an annual herb up to 50 cm more tall, erect, hairless. Stem is branched, the branches ascending spreading, more or less angular. Leaves are elliptic-ovate or oblong-round, 2.5-4 x 1-1.8 cm long (including the stalk), somewhat pointed, alternate, glandular streaked on the margin only. Flower racemes are 7-20 cm long, lax. Flowers are white to pale pink. Lowermost bracts are 5-8 mm long, up to 12.5 mm in fruit and deflexed, longer than the bract. 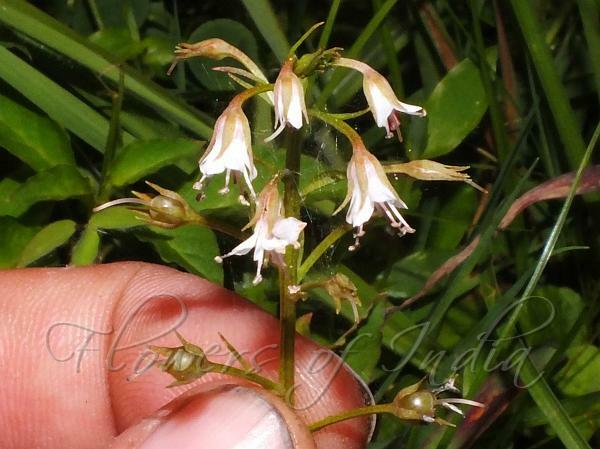 Sepal cup is bell-shaped, 3-5 mm long, sepals ovate-lanceolate, margin glandular streaked, crisp. Flowers exceed the sepal cup, 4.5 mm long, bell-shaped. Petals are obovate-oblong, blunt, toothed to wavy. Stamens protrude out, filaments 3-4 mm long, sparse glandulose, barely adnate at the base. Anthers are ovate-obtuse, c. 1 mm long, glandulose. Ovary is round, about 1.2-1.5 mm broad, style 4-4.5 mm long, persistent. Capsule is 3.6 mm broad, round. 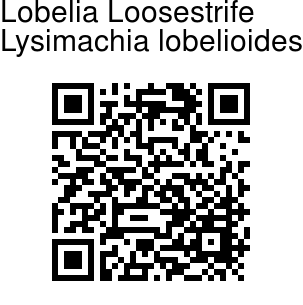 Lobelia loosestrife is found in the Himalayas, from Kashmir to Kumaon and eastward to Nepal, Sikkim, Bhutan and Yunnan. Flowering: June-July.